For those of you too young to know, this song is about a rat. A little beedy eyed nocturnal rodent. According to Wikipedia the song Ben was originally written for Donnie Osmond. It is the music for the movie Willard, which is about a killer rat. The song creeped me out. Rats creep me out. Well as much as I hate rats, I love my son. So when he asked about getting a beedy eyed creature for a pet, I cringed. This child and I have some history concerning his pet wants. He wanted some and I didn't let him have them. He did for a short while have a bubble eyed fish he named "Flip". Flip lived with us for two days. He went belly up for reasons unknown in the wee hours of his second night at our home. "You are 18 years old" my son's sister yelled at him. "You're not eleven. Eleven year olds get hamsters. Not grown men. Grown men don't get hamsters!!!" I can't really say why I caved and agreed to him having this critter as a pet...but I did and before the sun set the night he asked he was the caretaker and loving master of a Chinese long tailed Dwarf hamster. He didn't have to buy anything (other than the rat itself). His friend gave him a huge set up that included an awesome rat house, food and treats. My son's girlfriend, the braver of the two, agreed to coax Hugo out of his traveling box and into his nice clean new home. Should have been easy enough given the size difference between she and the pint sized Stewart Little look a like. Hugo quickly asserted his authority and chomped a couple of times on her hand. Hugo may have some issues. ADHD perhaps? He appears to not be interested in much for too long. He runs around the cage a lot and runs on his wheel almost nonstop. 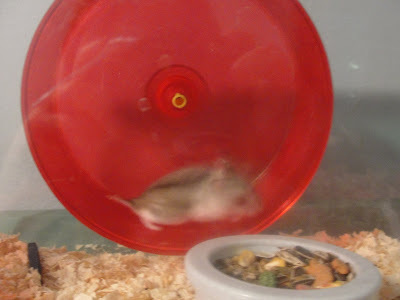 He only stops long enough to stretch out on the wheel for a second or two to catch his breath and then he's off and running again. Hugo and I may become friends...we have a lot in common. We sometimes bite the hand that feeds us, we're both pretty high strung and we spend lots of time spinnin our wheel(s). I had two hamsters. Both when I was over the age of 20. By the end of my 2nd hamster's life I also had cat. The end of my hamster was not caused by the introduction of my cat, let me make that clear. But after that one died, no more hamsters. All that to say that it's still ok to have have hamsters over the age of 11. Thanks for the comment Amy....I love that you sided with my big boy. Please stop by anytime.